Imagine heading to bed and never knowing if your carbon monoxide or fire alarm beeping will start in the middle of the night. That is my world here in my Lennar new construction home at the Westshore Yacht Club. And it has happened since about month two. Sometimes it is the carbon monoxide and fire alarm beeping. Sometimes it is a full siren. Both of them wake me up frequently in the middle of the night. Changing the batteries does nothing. All the batteries are fresh. The same thing happens in an entirely separate system that is in the detached guest retreat. Yes, they are frequently cleaned as well. When the batteries are changed, the alarm is reset by turning off the power, taking the power source out of the alarm and draining it as well. The below video was in the middle of the night. Warning – there is some language. Because of the frequency, I can get more than a little cranky when I am woken up by my carbon monoxide or fire alarm beeping. As you can see in the video, I knew what to do with this occurrence. Shut off the air conditioner and open the bedroom door. The alarm beeping will stop within minutes. The same situation happened two nights earlier. Sometimes the carbon monoxide and fire alarm systems begin a full siren. As you can see in the 11-second video below, the First Alarm light is flashing green. A green, flashing light on this CO and fire alarm indicates this one originated the activation of all the other alarms in the house. To stop the green blinking light, you must reset it. Each type of occurrence (beep vs. siren) has happened with both the fire and carbon monoxide alarms. I have gas in my Florida home which is rather rare. It’s an upgrade I wish I never even thought of especially given the state of my gas tankless water heater. In the below video which happened less than a week ago (and thankfully during the day). It was a different alarm, and the battery had just been changed a week before. As you can see in the video, as soon as I shut the A/C unit off, the beeping stops within minutes. The alarm is not labeled, so I am not sure if it is fire or CO.
At this point, I just ignore the alarms as there have been so many occurrences. Alarm Malfunctions – Construction Issues or Environmental Issues? The alarms have all been inspected by Lennar. Although none of them were found to be defective, they also just tested if the alarms would sound. Yeah – of course, they sound – just not at the right times. The electrical system has been an issue in this home since almost day 1 of closing. Lennar has officially stated there is nothing wrong with the power system. Corroding electrical components based on environmental factors; Lennar even found the insides of my ceiling fans to be rusted and corroded. One or both of these is likely causing many electrical shortages throughout the structure. A/C issues have been an epidemic with over TWO dozen A/C system malfunctions between two separate units. And this all occurred within about 4 years. 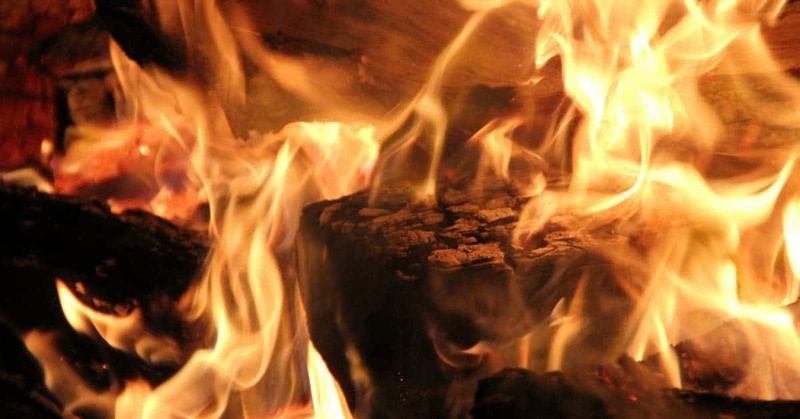 A/C is potentially omitting gas or other debris that is setting the alarms off. Both units were just cleaned and serviced in the last month. This happens in both the main house and guest retreat. A/C vibrations combined with faulty electrical wiring set both the alarm and the alarm chirps off depending on conditions. Environmental issues. It is very clear that something is going on here that I simply cannot see. As you can see in this post, all of my plumbing and other metal parts are corroding and have black ‘goo’ on them. This is true for both the main house and the guest retreat. Plumbing should NOT look like this after less than three years (when these pictures were taken). Plumbing should NEVER appear like this. The indoor environmental specialists have been stumped and have only seen this occur in industrial settings. Which always brings me back to what was here before Lennar (WCI Communities) bought the land to build what would be the Westshore Yacht Club neighborhood. Imagine going to bed and doing everything that you are supposed to do to get a restful night of sleep so you can rock it out the next day. Now imagine knowing – that regardless of what you do right – you never know if this will be another night of disturbed and broken sleep because of alarm beeping or sirens. That is my world at the Westshore Yacht Club. That is the world that Lennar is well-versed. It is the world of which I am not the only one living. And it’s not only the Westshore Yacht Club. Nonetheless, the direct and indirect costs of my regretful purchase here continue to rise. 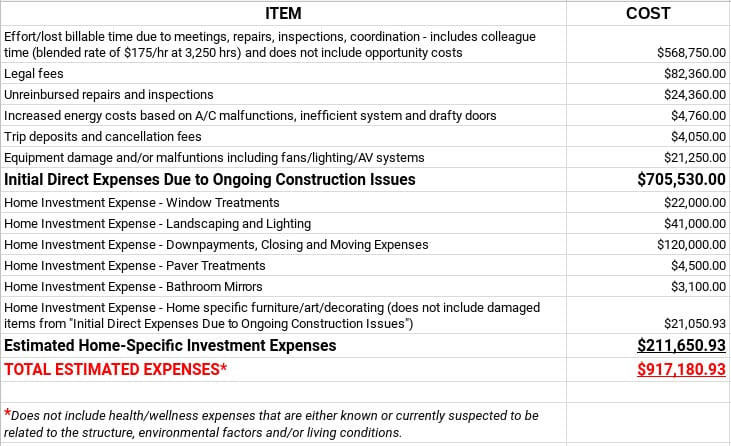 These are the running direct and indirect costs of a Lennar home construction defects.